Tankformers Eli Evans has made a late switch to a Race Torque Engineering prepared Skoda Fabia R5 for this weekend’s Make Smoking History Forest Rally in Western Australia, which kicks off on Friday. Evans is the latest to announce a car swap in what is becoming the trend at this year’s Forest Rally – Yes! Optus’ Adrian Coppin will also run a Race Torque Engineering Skoda Fabia R5 after competing in the Peugeot 208 AP4 at The Courier Eureka Rally, and Glen Raymond has temporarily traded his Mitsubishi Evo IX for a Subaru Impreza WRX STI. Evans cites ongoing developments with the Mini Cooper AP4 as the reason for leaving it on the east coast for round two of the CAMS Australian Rally Championship. “Preparation after our third place at Rally Eureka has been extensive,” explains Evans. “Although third is a nice net of points, it’s not where myself and the team want to finish in the Mini Cooper AP4. While Evans is unable to drive the Mini Cooper, the switch to the Skoda Fabia R5 gives the team the chance to compete in the Forest Rally and stay in the championship race. 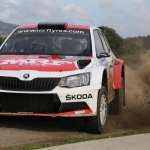 “My aim is to win the championship this year and by being here at the Forest Rally, we remain in the race,” Evans said. “It’s definitely disappointing not to be driving the Mini Cooper AP4 over here, however, I’m also excited about the opportunity to compete in a world class FIA rally car. The Make Smoking History Forest Rally action begins on Friday afternoon with a ceremonial start and two passes of the super special stage at Barnard Park in Busselton before moving south to the forestry rounds around Nannup on Saturday and Sunday. Click here for more information on the Make Smoking History Forest Rally.